This is not your Gramma’s pumpkin pie! 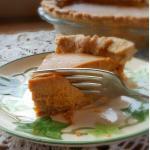 Three kinds of ginger – fresh, ground, and crystalized – give this pumpkin pie a spicy punch. My mom was my Camp Fire leader for many years, and when I was in the third or fourth grade, she gathered our group together on the day before Thanksgiving and taught us all how to make pumpkin pie. We each got to make our own pie (with ample help) and then we delivered them all to our local Salvation Army kitchen so that they could be served at their annual Thanksgiving dinner. After mixing up a couple of big bowls of pumpkin custard, she showed us how to make a pie crust before she helped us make our own. It was magic, watching my mother make a pie crust, like a dancer on a stage. I can still see her – bending over our shiny yellow Formica kitchen table, dusting the surface with a sweep of her hand and flouring the rolling-pin in one graceful motion. Then rolling out the dough in smooth, perfect strokes. Her crust was always even and flawless. Then then pie plate upside down on dough and a clean circle cut with her paring knife exactly two inches away from the ring, all the way around. Roll the dough up on the pin and gently roll it out again, covering the pie plate and tucking it in, her delicate hands deftly fluting the edges with perfectly practiced pinches. Finally, crust complete, she filled it with the sweet, spicy pumpkin custard and eased it slowly into the oven. It is an image of my mother that I treasure. The next hour or so was not so much a dance as it was circus, but in the end, each of us girls had a pie in the oven that we could claim. Once they were done and cool, I remember driving down Sandy and across the Burnside Bridge into “the city,” and then handing my pie to the lady there in the Salvation Army kitchen and looking up at her as she thanked us all and told us how much those pies would mean to the people who ate them. It made me feel really special. I know it was just a pie, but it was also the first time I remember ever having that glimmer of understanding that my contributions to my community mattered – that they were important. So it maybe it wasn’t just a pie after all. The rules have changed, so likely you can’t deliver your home-baked pie to the local homeless shelter kitchen anymore, but there are so many ways to serve in the community every day, not only in the holiday season, but all year round. And usually, it takes less time out of your day than making a pie. ½ cup butter-flavored Crisco Sorry, but this really does yield the best results, and it is the only time I ever use it, I promise!! ½ cup butter – chilled in freezer for one hour Don’t use margarine. I always use salted butter, but you don’t have to. In a medium bowl, mix flour, sugar and ground ginger with a fork. Stir in crystallized ginger and make sure each little piece gets coated with flour so they don't stick together. Mix in Crisco shortening with a fork or your fingers, then cut cold butter into ¼ pieces and sprinkle them into the flour mixture. Mix with your fingers some more – until mixture resembles very coarse crumbs. Roll out and form your pie crust. You can now bake your pie one of two ways - either just fill it and bake it, or prebake the pie shell. I prefer to prebake it: one of the main complaints people have about pumpkin pie is that it they get soggy, and prebaking alleviates this problem. This is the method I use for prebaking the pie shell: Put your formed crust into the freezer for about 15 minutes. When you take it out, cover the edges with a ring of aluminum foil, snugging the foil right down onto the formed dough. Line the bottom of the pie pan with a circle of foil and then fill with beans, or use pie weights if you have them. Bake 20-25 minutes at 325°. Remove the beans and bake an additional 15 minutes. Let cool. Whisk eggs and egg yolks together in a large bowl. Put minced ginger and 1/4 - 1/2 cup half & half in a small blender and blend until smooth. (Use only as much half & half as you need to.) This is way easier than grating fresh ginger. Way, way, way easier. Mix pumpkin, spices, and pureed ginger into eggs. When pie crust is prepared, heat remaining half & half over medium low heat until nearly boiling (do not boil it!). Remove from heat and add to the pumpkin mixture. Fill prepared pie shell with warm pumpkin custard and bake for 30-60 minutes, depending on the size and depth of your pie. It is done when a knife inserted comes out clean. Freeze your crystallized ginger first - this will make it much easier to mince! 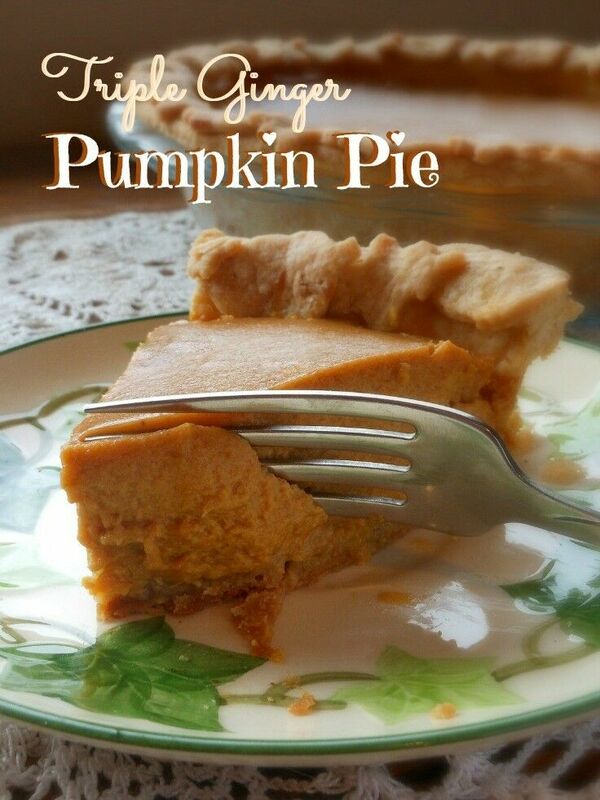 I’m not a fan of pumpkin pie, but I do love recipes with a great back story. Your is so touching. I imagine you remember your mother every time you bake a pie! Very touching story. I like being of help especially when it has to do with providing food for the hungry. Happy SITS day, enjoy it! Oh my!! Looks so good. I love pumpkin pie and I’m weird i know, but i love to add cranberry sauce as a topper. I don’t think that sounds weird at all! Do you make your own cranberry sauce? Oh my goodness! This looks amazing! I love the way described your Mom making a pie crust as dancing. Beautiful. Thank you for the kind words, Katie. Writing has been an important part of my life forever, but food blogging is definitely a new adventure. Oh, the places life takes us! I read your Coco Chanel post and pinned it. Someday I’d love to be able to composed an image as easily as I can compose an essay: I have a long way to go in that department! What a beautiful story! I love ginger, so it would be a fun mix in a pumpkin pie. Visiting from The SITS Girls. That pie looks really delicious!